One of the most popular search engines online today was actually started created by three former PayPal employees back in February 2005. It’s not Google, Yahoo, or Bing – it’s YouTube. 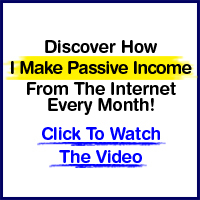 The site attracts countless viewers every day and is considered to be the largest video based website on the Internet. Developing and promoting videos is a great way to generate traffic and promote your products, services, and special offers. The question everyone wants answered is how to get your videos ranked high on YouTube and even appear in organic search results too. The good news is that by following a few basic optimization principles, you can quickly and easily optimize your videos for YouTube. Let’s start with some basic YouTube ranking factors. This search engine works differently than other search algorithms. From my experience, where you appear on the platform and in relation to specific search queries depends on a few factors. 1. Relevancy. Metadata is exceptionally important on YouTube because of the search algorithm itself as well as the role that related videos play as part of the overall video viewing experience. Your video title, description, keywords, etc. are heavily weighed as part of search queries. 2. Ratings. YouTube, just like Amazon, puts a lot of weight on user ratings. The rating and quantity of reviews indicates the viewer’s approval of your video and tells the search algorithm that your video is ideal to promote to the rest of the YouTube universe. 3. Responses. YouTube is also very interested in the comments and responses that others are making. When individuals take the time to submit video responses in addition to comments, YouTube gauges the additional interest as a key indicator of popularity, thus moving your video higher and higher in search results. Optimizing your video is based on four simple, yet powerful steps. True video optimization begins with the video itself. It’s then followed by properly formatted titles, tags, and descriptions. When you produce your video, keep your video length longer than one and a half minutes but shorter than eight minutes. Videos that seem to rank well both on YouTube and organically follow this general rule of thumb with regard to length. Also, be sure to speak clearly when producing your video, using keywords in the first 10 seconds of the video and last 10 seconds of the video. It’s believed that Google is actually indexing some of your audio. Title your video like you would a pay-per-click ad. You want users to click through on your title to improve interactivity and views. It's certainly believed that having a strong title and good click-through-rate can boost the rankings of your video. When creating your title, include your most important keywords at the beginning of the title and keep the title brief. The shorter the title the more weight you're giving to your keyword phrases. However, you want the title to be powerful enough to encourage clicks. Remember to use your keywords first, branding last, and encourage click-throughs. When creating your description, again, be sure to use your keywords in the beginning. You definitely have more room than you did in your title or even on conventional search engines to describe your video. Keep in mind that you can use the description to include information about your video in general and provide specific info on products or services. I always like to place a URL to a site I’d like to promote at the very beginning of my YouTube video description. 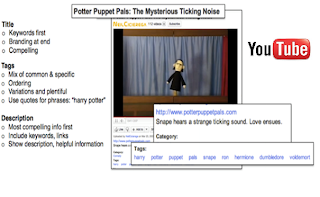 This ensures that the URL is visible and clickable next to your video. It’s a great way to promote third-party sites, passing authority and link juice of significant proportion. One of the best ways to optimize your tags is to again begin with your chosen keyword phrase. The second step is to do some research in the channel that your video will likely fit into. What types of tags are being used by the top ranking videos? You should integrate some of the same tags into the tags associate with your video to ensure a good ranking among similar videos that have already been posted. 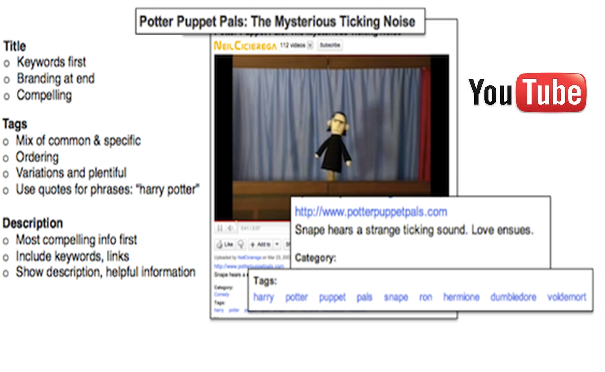 Optimizing just a few features on YouTube such as the video itself, title, description, and video tags is a good starting point for improving the ranking of your videos. There are a variety of additional techniques to further optimize videos for YouTube that deal more closely with the social aspect of the video site itself. Views, reviews, etc. are all significant factors designed to manipulate video rankings on YouTube. I’ll be sure to cover these additional factors in future posts. Nice post. Does YouTube take into consideration of the negative comments as well or just any comments in general? YouTube is the next search engine for me if I cannot find something on Google. My question is also same as Rachel Tam, If we receive more dislikes than how Google response to our video. Good article. Some good tips. We are trying to use video more in our promotional gift business. Product reviews etc. YouTube is a brilliant way to engage with more potential clients. Great post. It is indeed true that Video Marketing are popular nowadays since it can drive huge amounts of traffic to your sites. Youtube is very popular and millions of people are visiting to have their daily dose of videos. The information seems to be good and really useful which can give help in many of the tasks,so great work this is. I appreciate your post for optimizing Youtube videos but in the recent youtube changes there some algorithms. It can be work. Nice stuff on youtube optimization. Thanks. I really appreciate about to see your post.It is fantastic Article about YouTube shared here!! YouTube is the best social Media for video.All peoples like this YouTube!! Good post regards to youtube video. Thanks for this useful post. I want to share this to my friends.